E. A. Judge’s academic career began at Canterbury University College, Christchurch NZ, with Philosophy, just before Karl Popper left for London. Otherwise Judge’s formal education was in languages, culminating in 1949 with the Latin Honours M.A., and in 1955 with the Classical Tripos at Cambridge. His first teaching appointments from 1948 had been in languages, but from 1956 his formal discipline was History, at the University of Sydney until 1968, then in the Second Chair of History at Macquarie, where he remains Emeritus. In 1984 Edwin Judge was visiting Professor of Classics and History in the University of California at Berkeley (standing in for Erich Gruen and Peter Brown respectively). The nexus between Classics and History began with a schoolboy desire to locate the Pauline epistles within the history of culture. Its landmark was the year 1960, with the appearance of (a) The Social Pattern of the Christian Groups in the First Century (Tyndale Press, London), and (b) The Journal of Religious History, where Edwin Judge was an associate editor, responsible for reviews. There were consequences in either case. (a) The intellectual focus of Judge’s studies might be described as the attempt to grasp the large course of history by working from the linguistic detail of documentary sources. At the initiative of publishers and of the different editors three collections of his papers have now appeared: (i) D.M. Scholer, Social Distinctives of the Christians in the First Century (Hendrickson, Peabody Mass. 2008); (ii) J. R. Harrison, The First Christians in the Roman World: Augustan and New Testament Essays (Mohr Siebeck, Tübingen 2008); (iii) A. M. Nobbs, Jerusalem and Athens: Cultural Transformation in Late Antiquity (Mohr Siebeck, Tübingen 2010). The central argument behind the 74 studies included is that the extraordinary dynamism of the modern West arises from the tension between Athens and Jerusalem, their incompatible views of the world being now inescapably embedded in everyone’s mental and social cultures, unreconciled. (b) As an editor, Judge has been actively involved in the founding and development, not only of the Journal of Religious History, but also of the Journal of Christian Education; Antichthon: Journal of the Australasian Society for Classical Studies; Ancient History: Resources for Teachers; and Interchange: Papers on Biblical and Current Questions; as well as the two series of monographs Sources in Ancient History, and New Documents Illustrating Early Christianity. As a teacher, Edwin Judge has worked at several levels in developing the scope and methods of Ancient World studies within the History curriculum. For the Higher School Certificate the old high-quality Graeco-Roman syllabus in Ancient History was expanded under his chairmanship to embrace the Ancient New East as well, using archaeological evidence and literary sources in translation. At Sydney University the first-year survey course on the Ancient World (with which all History students had begun) was trimmed back to allow for advanced work in the field up to thesis level. Conversely, at Macquarie the Ancient field worked from an Early Modern base, and came to allow (at higher levels) for historical access to what at Sydney had been taught within Languages, Archaeology and Divinity. Validation for this lay especially in the ‘documents’, i.e. texts inscribed upon ancient artefacts retrieved by excavation (coins, inscriptions, papyri). 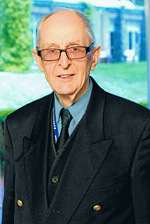 Edwin Judge has been appointed a member of the Order of Australia, elected a member of the (International) Studiorum Novi Testamenti Societas and an Honorary Fellow of the Australian Academy of the Humanities, and awarded the honorary degree of Doctor of Letters at both Sydney and Macquarie Universities.